This statement is in keeping with what Martyanov sees as his book's key mission: to assist his native country in defending its national sovereignty, which entails acting to prevent a nuclear world war. As he states in the conclusion of his book, Losing Military Supremacy, he is most worried that it is the United States that will pull the trigger to set off world war III. "The main task today is to prevent by all means any possibility of this delusional, self-proclaimed exceptional nation unleashing Armageddon because of frustration with its own weakness"" so well exposed by now. Martyanov refers to the fact that despite all the hubris, the US has failed to win most of the wars it has started since WWII. Korea was a stalemate. It lost to Vietnam/Cambodia/Laos. Afghanistan will never be conquered. The victory over a much inferior Iraqi military largely destroyed the cradle of civilization and left nearly all its people hating the US. The current government wants the US out of its country and is allied with Iran, a country the US government sees as an enemy. The US got rid of Libya's leader Muamar Gaddafi only to have him replaced by three internally fighting self-declared governments, whose extremist Muslims wantonly murder, smuggle and enslave people. The once richest people in Africa are now among the poorest. The US has divided people in Syria, and also in Ukraine where they installed a neo-fascist following a US-orchestrated and funded coup government. 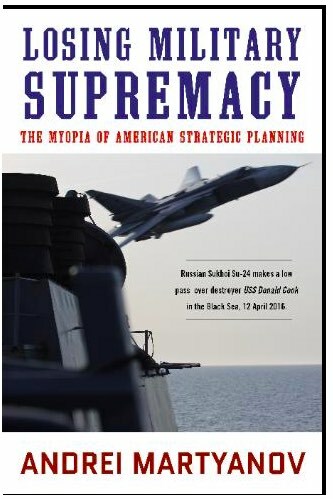 The US's military thinks in terms of offensive weaponry and strategy much more than in defensive ones"
This book offers a perspective from an author with expert knowledge of both Russian and US nuclear strategy and capabilities which is not heard in the US. It's a disturbing perspective, but one which every American worried about the prospect of nuclear armageddon should be aware of, especially when National Security Advisor John Bolton is a war-infatuated nutcase and our Secretary of State Mike Pompeo is a Christian fundamentalist nutjob who believes in and looks forward to the advent of Armageddon.